I love this recipe because it's really healthy and tastes great. Fish cakes can be eaten hot or cold, for lunch or dinner, and mums will appreciate that you can throw just about any vegetable into this dish and it'll still taste fab. Perfect with a garden salad of your choice and my asian salad dressing! It's a no-muss, no-fuss dish that wins big smiles in my household. 500g skinless fish fillets. We love to use salmon, but almost any fish will do. 2 spring onions, washed and finely chopped. 2 tbs Red Thai Curry paste. 1 tbs brown sugar. (Palm sugar is better, but that's being fussy). 2 cooked potatoes (the little white ones are nice). Blend all ingredients except for beans until well combined. Then add chopped beans to the mixture. Divide mixture into balls (think hamburger-patty sizes) and then flatten slightly. Dust with flour to minimise sticking in the pan. Fry fish cakes in a hot pan, allowing one minute for each side, or until golden brown. Best to cook the rissoles in batches of about 4 at a time. Note: It's entirely possible to bake your fish cakes instead, but I find that the crispy exterior gives a great crunch. 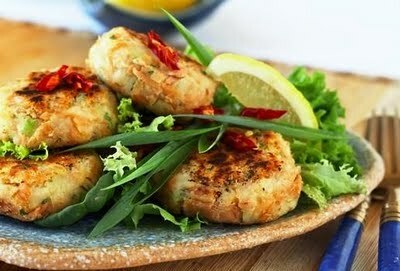 Allow fish cakes to drain on kitchen paper and serve with green salad and asian dressing. This dish is so great hot out of the pan, but I think I prefer mine cold, the day after we've had them for dinner. 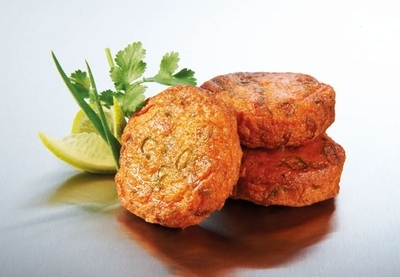 One fish cake is just perfect for lunch or an afternoon snack!